The basic human body plan, the arrangement of organs in the body, is laid down during embryonic development. Insight into the formation of this plan informs researchers re normal development versus the development of congenital malformations, the latter of which have an incidence of 3% in the human population, and cause up to one-quarter of all neonatal deaths. Despite modern technologies such as three-dimensional imaging, the intricate morphogenesis of the developing human body is difficult to understand. 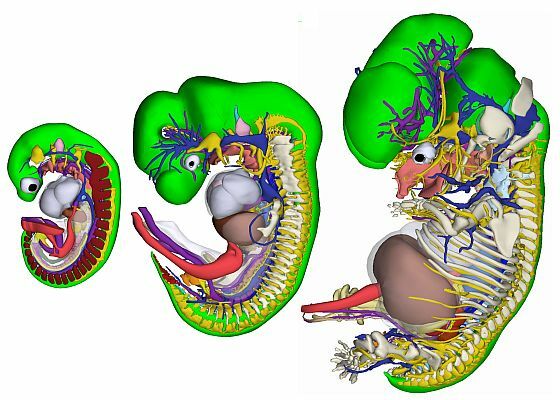 Now, researchers at the Academic Medical Center develop a three-dimensional atlas of the development of a human embryo, which anyone can view online. The team state that their atlas clears up many misconceptions about the development of the human embryo, and offers a new perspective on birth defects. The opensource study is published in the journal Science. Previous studies show that textbooks on human development are often based on the works of early embryologists, some published more than 100 years ago. Due to the limited availability of human embryonic specimens, it is difficult or impossible to independently verify the information carried in these textbooks, or assess whether this information is derived from studies on human or animal models. The current study digitized pictures, over a time period of seven years, of more than fifteen thousand sections of embryos in the age range of fifteen days to two months. The current study develops a three-dimensional digital atlas and database spanning the first 2 months of human development, based on analysis of nearly 15,000 histological sections of the renowned Carnegie Collection of human embryonic specimens. Results show that up to 150 organs and structures per specimen identified and labeled, making three-dimensional models to quantify growth, establish changes in the position of organs, and clarify current ambiguities. Data findings show that the atlas provides an educational and reference resource for studies on early human development, growth, and congenital malformations. The lab state that a number of detailed analyses of the development of the kidney, pharyngeal arch cartilages, and notochord show that the current descriptions of the development of these organs are based on comparative animal models rather than on factual observations in human specimens. They go on to add that these examples demonstrate the scientific value of the atlas. The team surmise that they have generated interactive three-dimensional digital reconstructions based on the Carnegie collection of histologically sectioned human embryos spanning the first 2 months of gestation. For the future, the researchers state that their atlas will serve as an educational and reference resource for the global medical community with relation to human development and development-related congenital diseases. For seven years, worked out by 75 (bio) medical students from the University of Amsterdam. They have been digitized pictures of more than fifteen thousand sections of embryos in the age of fifteen days to two months. The embryos are from the historical Carnegie collection in the United States. Credit: Academic Medical Center (AMC).